The aim of this blog is to provide information on the risks of Lyme disease in dogs, disease transmission, clinical signs, diagnosis and prevention. Lyme disease is the most common vector-borne disease affecting humans and pets in Europe, with over 65,000 human cases reported annually. Its prevalence is reported to be increasing and, in the UK, rates have risen by over 350% between 2001 and 2011. The disease is caused by infection with bacteria called Borrelia burgdorferi, and is transmitted by tick bites. 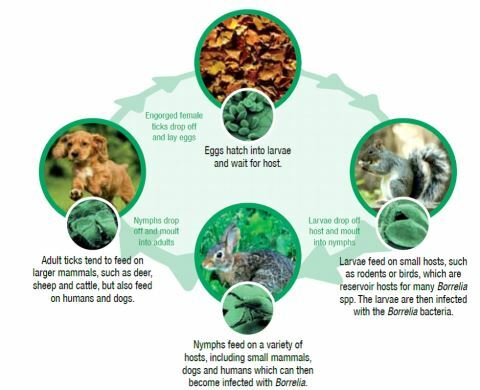 The disease is transmitted by ticks from the Ixodes species, such as Ixodes ricinus and Ixodes hexagonus, which are the most common type of ticks found on dogs in the UK. Because of this transmission cycle, the risk of Lyme disease is closely related to tick distribution and prevalence, although not all areas with large numbers of ticks are necessarily high-risk sites for Lyme disease. As shown in this diagram, tick larvae acquire the Borrelia bacteria when they feed on small mammals or birds, which act as reservoir hosts. At subsequent stages of the life cycle, the tick nymphs and adults can then transmit the bacteria to other hosts, including humans and dogs, during blood feeding. Exposure to ticks is an important risk factor for Lyme disease, and tick numbers are likely to be higher in areas of woodland, moorland, heathland and rough pasture. Dogs that are regularly walked in such areas are therefore potentially at higher risk of infection. Certain geographical areas are also recognised as particularly high risk for human infection; these include Exmoor, the New Forest, the South Downs, parts of Wiltshire and Berkshire, Surrey and West Sussex, Thetford Forest, the Lake District, the North York Moors and the Scottish Highlands. In some cases, infection does not cause any obvious clinical signs (sub-clinical infection). In those dogs which do develop clinical disease, the signs can be vague and non-specific. 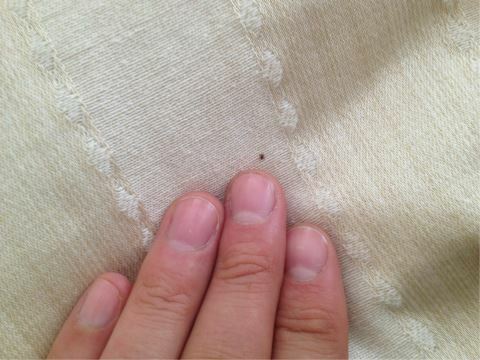 This makes recognition of the disease difficult, further complicated by the fact that there can be a long delay (up to 5 months) between the time of the tick bite before the dog develops signs. Occasionally, more serious complications can occur. These include kidney disease (“Lyme nephritis”); this potentially fatal complication is thought to be caused by the dog’s immune response to the bacteria rather than direct damage to the kidneys. Labradors and Golden Retrievers are thought to be predisposed to developing this complication. As is the case in humans, definitive diagnosis of Lyme disease can be challenging. Diagnosis therefore depends on a combination of clinical signs, history of exposure to ticks, response to treatment and diagnostic testing. Diagnostic tests can be used to detect the bacterium itself in the tissues, or to demonstrate exposure to Borrelia by measuring the dog’s immune response (antibodies). Test results can be difficult to interpret, as both false positive and false negative results can be found. Treatment is often based on a combination of symptomatic management, such as the use of painkillers to manage lameness, and the use of antibiotics to kill the bacteria. Several different antibiotics are considered to be effective, although doxycycline is usually the treatment of choice. Relatively long courses of treatment are recommended, as the bacteria can be difficult to eliminate. Clinical signs generally resolve quickly once treatment is started. However, even long courses of treatment do not always eliminate the bacteria and disease can recur again in some cases, requiring repeated courses of antibiotics. How to prevent Lyme disease? Vaccination: A vaccine to help protect dogs against Lyme disease has recently become available. Please come and talk to us about how we can help you to protect your pet or call us on 01823 271042.